Only A Child helps disadvantaged youth in Guatemala work toward long-term self-sufficiency by promoting healthy physical, emotional, vocational and spiritual growth. For over 20 years Only A Child (OAC) has touched the lives of hundreds of children and youth. More than 60 youth have lived in the shelter. The program maintains a shelter with space for up to 10 disadvantaged young men, runs a carpentry shop in which they learn job skills, and sends them to accredited independent schools. These components meet three primary goals: (1) to give the youth a sense of family and what the inherent responsibilities are for family membership; (2) to provide them with carpentry skills and with a sense of accomplishment, including the development of work ethics that prepare them for successful future work opportunities; and (3) to give them the opportunity to advance their schooling up to and including university level education. Those living in the shelter are provided structure, protection and guidance to fulfill their dreams of education and to provide tools for living productive lives. In addition to those youth who live in the shelter, Only A Child’s Outreach Program interacts with parents of young children living in poverty to provide them with educational opportunities.Only A Child’s shelter has evolved from its beginning serving homeless street children, most of whom have “graduated” from the OAC programs. 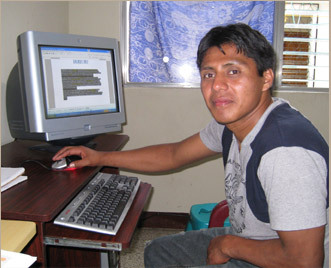 Currently, the shelter houses young men 18 and over from Guatemala City and impoverished youth from the countryside. The first residents who came to the shelter had lived on the streets and were somewhat younger than the current residents. Though the chronological ages of the current residents are older, often they must begin their education at the middle school or lower grade levels. Developmentally, because of drugs, alcohol, poor nutrition or the many impacts of poverty, their maturity levels are those of a younger age. Only A Child provides life skills enabling youth to contribute to their own stability and that of their homeland, thus avoiding the perpetuation of violence and critical economic need that has led many youth to leave Guatemala under dangerous conditions. Only A Child maintains a shelter and a carpentry shop for youth in Guatemala City, but the shelter is far more than just a place to sleep. George Leger says it provides a surrogate family in which the kids are taught accountability and responsibility. They must contribute time and effort daily toward meeting the needs of the family. In return, it gives them a place to belong, a place where they are respected and cared for, a place where they can grow and develop an identity complete with confidence and self-esteem. The carpentry shop, where program participants produce finely crafted cedar boxes, serves a higher purpose. 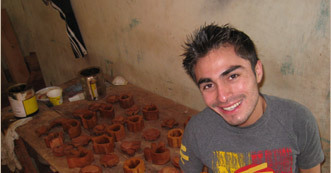 The youngsters who work in the shop produce objects of real beauty, helping to support the program that nurtures them. By working to develop a skill, they learn that they are capable of succeeding in life, once given the opportunity. With time they are able to see themselves in a different light, as valued and productive members of their society. To further complete their preparation and maximize their opportunities to leave the streets and rise above the poverty in which they have been enmeshed, Only A Child sends its program participants to accredited independent schools through university level. This means for many the chance to realize a life-long dream “to fill a desk at school” and one day become a contributing member to society. Only A Child reaches out to girls and boys between the ages of 5-13 to provide help to impoverished families in and around Guatemala City. OAC purchases school books, uniforms or school supplies for these children as needed. At times medicines have been purchased for the children of “graduates” of the OAC program. Whatever the need, OAC makes a genuine attempt to meet it. When OAC helps a child with educational costs, it continues to assist the same child on a yearly basis, as long as the parents demonstrate that they are caring for their child to the best of their ability. Only A Child provides such help for an estimated 8 to 12 children a year through this outreach.